So far on the FX series American Crime Story, Robert Kardashian has been portrayed as one of the more sympathetic figures in the O.J. Simpson trial. A longtime friend of Simpson, David Schwimmer's Kardashian is a loyal, religious man who can't even entertain the thought that someone so close to him could commit the crimes he was charged with, and later found not guilty of. 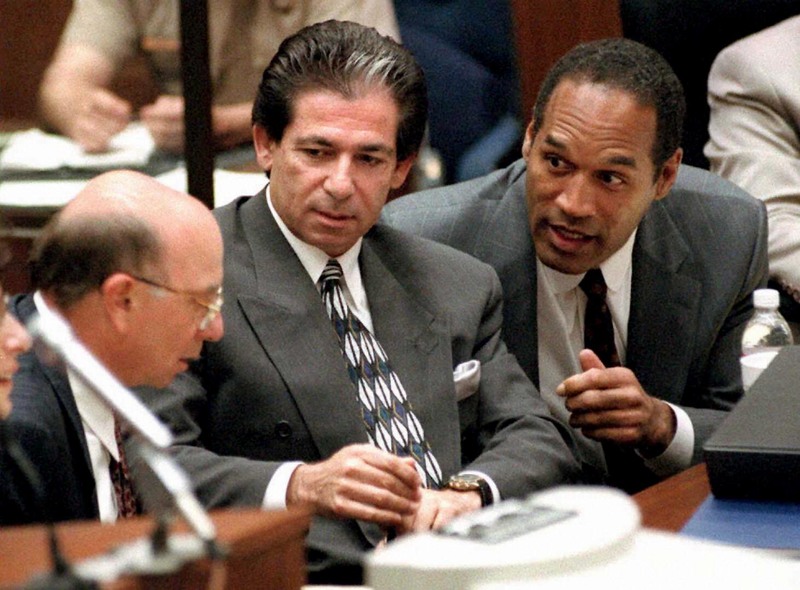 But in real life, there was a controversial moment of his involvement in the trial when, according to the New York Times, Robert Kardashian removed a Louis Vuitton garment bag from Simpson's home. What was in the garment bag that made Kardashian taking it such a hot topic? In the same article, the New York Times reported that Kardashian was photographed with the bag on June 13, 1994, the day that the bodies of Nicole Brown Simpson and Ronald Goldman were found outside of Brown Simpson's Brentwood home. The publication describes the bag as "bulging" and stated that Kardashian was accompanied by Simpson's assistant Cathy Randa on the errand. According to the NYT, when the bag was introduced as a piece of evidence on March 29, 1995, it was empty, and Kardashian said the controversy surrounding this bag and luggage Simpson had been seen with on the night of the murders was "totally out of proportion." However, that controversy still exists today. In a 2014 interview with the Daily Mail, Goldman's father, Fred, claimed that Kardashian removed incriminating materials from Simpson's home. "That evidence would have convicted the killer," he claim. Goldman didn't claim to know what exactly that evidence was, but asserted his belief that Kardashian helped to dispose of evidence. Kardashian was never charged as an accessory, nor were the contents of the bag ever admitted into trial evidence. Simpson's friend was never even asked about the piece of luggage in court. In its 2003 obituary for the deceased former lawyer, The New York Times stated that Kardashian — who had served on Simpson's expanded legal team — "asserted attorney-client privilege and was never called to testify." Prior to his death, Kardashian reflected on Simpson's case in a 1996 interview with Barbara Walters on 20/20. As reported by CNN, during the interview Kardashian said he had "doubts" about Simpson's innocence. Still, Kardashian maintained his ignorance of the items inside the infamous garment bag. He told Walters that he had never opened the bag, and that the police never even asked Simpson's team to turn in the item. "They never sought to do so," Kardashian claimed. "In fact, when we turned it in to the court nine months later, they still never did any tests to see if there was blood. I don't believe they really wanted to know the answer."